Terri been, sister of Jeff Wood, testified at the meeting of the House Committee on Criminal Jurisprudence on April 15, 2019 in favor of Rep. Dutton’s bill to prohibit the death penalty in law of parties cases, such as Jeff Wood’s case. The hearing was scheduled for 2pm, but they did not get to the bill on law of parties until about 9:30, so we waited all day to testify. Contact members of the committee and urge them to vote in favor of the bill. Also testifying was Elsa Alcala, formerly a Republican judge on the Texas Court of Criminal Appeals, the highest criminal court in Texas. For the first time, a Texas Senator has filed a bill that would prohibit death sentences for people convicted under section 7.02(b) of the Penal Code, (the law of parties). The bill was filed by Senator Juan “Chuy” Hinojosa and Senator Eddie Lucio Jr signed on as a co-author. Until this session, a law of parties bill had only been filed in the Texas House. We will let people know when a committee hearing is scheduled on the senate or house bills. Thank you to Rep Jeff Leach for filing HB 4113 to prohibit death sentences for people convicted under section 7.02(b) of the Penal Code, (the law of parties). The bill was filed on March 7, 2019. We will let people know when a committee hearing is scheduled on the bill. Photo of Rep Leach speaking at a press conference in 2017 about the law of parties. Relating to the applicability of the death penalty to a capital offense committed by a person with severe mental illness. Relating to the extent of a defendant’s criminal responsibility for the conduct of a coconspirator in certain felony cases. Relating to an application for a writ of habeas corpus based on certain relevant scientific evidence that was not available at the applicant’s trial. Relating to certain sentencing procedures in a capital case. Relating to the creation of a commission to study intellectual and developmental disability determinations in capital cases in which the state seeks the death penalty. This change should satisfy the objections that Justin Wood of the Travis County DA’s office testified at the hearing in April that he had about the bill. Call the committee clerk to urge Chairman Joe Moody to put HB 252 by Rep. Terry Canales on the agenda for the next meeting during the special session going right now this summer. Terri Been, sister of Jeff Wood, testifying before Texas House Committee on Criminal Jurisprudence on April 17, 2017 in support of law of parties reform bills. Under the provisions of the bills, a death sentence could not be sought or imposed on a defendant whose liability for a capital felony offense was based solely on the capital felony occurring in furtherance of a conspiracy to commit another felony offense in which the defendant was a co-conspirator. 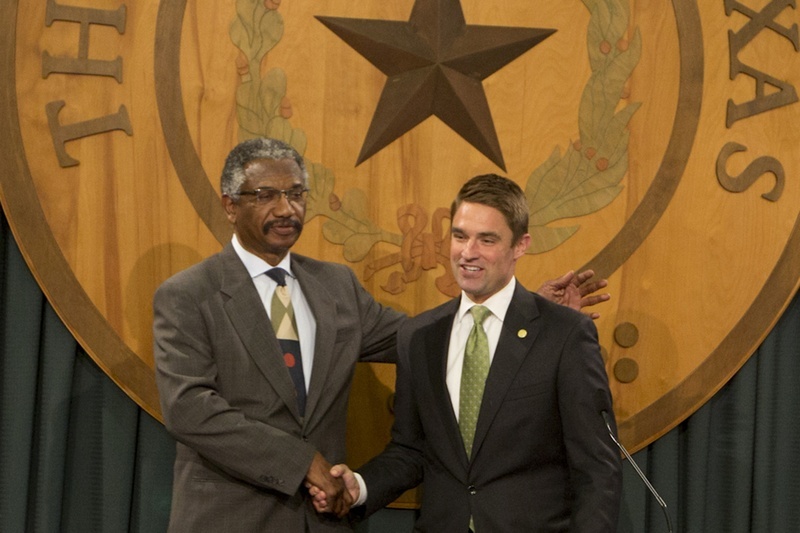 State Reps. Harold Dutton, D-Houston, left, and Jeff Leach, R-Plano, speak at a press conference on the death penalty and the law of parties on April 17, 2017. 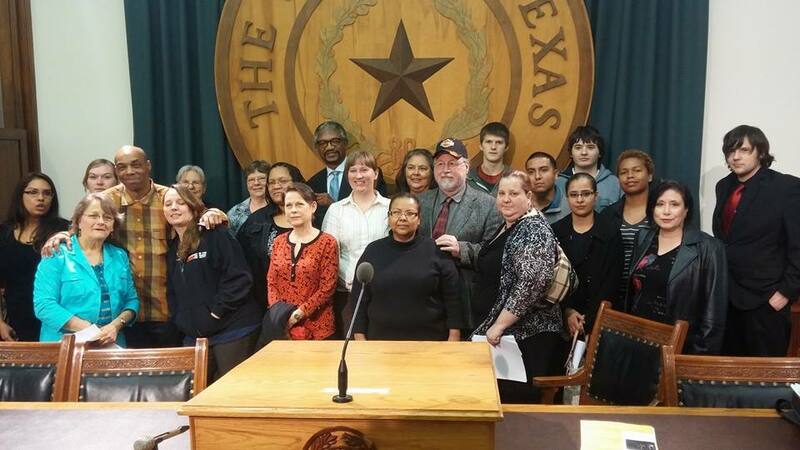 The death penalty was a hot topic at the Texas Capitol Monday night. Testimony on five capital punishment bills was heard by the House Criminal Jurisprudence Committee in a seven-hour-long meeting that lasted until close to midnight. The bills included two that would stop the practice of sentencing accomplices to death in certain cases and two which would abolish the death penalty altogether. 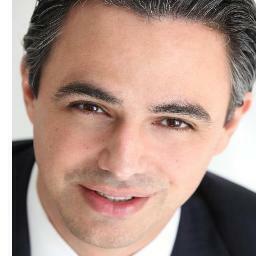 House Bills 147 and 316, by Democrats Harold Dutton and Terry Canales, respectively, would change how a person could be sentenced to death under Texas’ “law of parties,” which holds that those involved in a crime resulting in death are equally responsible even if they weren’t the actual killer. The most prominent case of a current Texas death row inmate sentenced under the law of parties is Jeff Wood. Wood was convicted in the 1996 murder of Kriss Keeran, who was fatally shot by Wood’s friend in a Kerrville convenience store while he sat outside in a truck. Last year, Wood’s case garnered national attention as his execution neared. Texas lawmakers from both parties spoke out against the execution, which was halted days before the scheduled date. Republican Rep. Jeff Leach has been one of the most adamant supporters of reforming the law of parties. He has taken an interest in Wood’s case, going so far as to visiting him on death row in February. 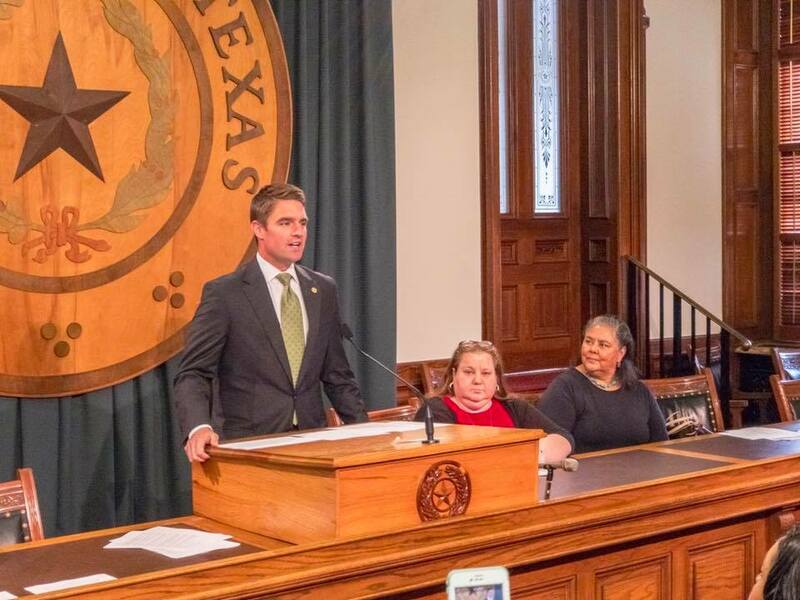 “I promised Jeff that I and Chairman Dutton and Rep. Canales would do everything that we can this session to ensure that another case like Jeff Wood’s case would never happen again in the state of Texas,” Leach said at a news conference earlier Monday on the bills. There are two ways to find someone guilty under Texas’ law of parties. The first puts responsibility on those who help commit or solicit a crime, even if they weren’t directly involved. The second states that all parties are responsible for one felony that stems from another if the second “should have been anticipated.” For Wood, the state argued he was willfully participating in a robbery and knew his accomplice would resort to killing if Keeran did not comply, so Wood should have anticipated the robbery would lead to a murder. Wood has maintained he didnt know his friend had a gun on him. The reform bills focus mainly on the “anticipation” clause, removing the possibility of a death sentence if someone is found guilty under the second part of the law of parties and automatically granting them a sentence of life without parole. Currently, after being convicted, a jury still must agree the convict intended to kill or anticipated death to issue a death sentence. But Dutton argued that those people would still be punished, just not to death. Chairman Joe Moody, D-El Paso, said Wood’s testimony resonated with him as he has long struggled to “strike a balance” with the law of parties and the death penalty. In 2009, a similar bill filed in the House made it to the Senate, but died there. Terri Been, Jeff Wood’s sister, said she has been lobbying against the law of parties for 20 years and pleaded through tears for the Legislature to move it forward this year. “My cries have fallen on mostly deaf ears. I’m begging you to be leaders and to lead your constituents in the right direction,” she said before wiping her eyes. It is not common for a jury to sentence someone to death under the law of parties, but it happens. In 2007, prison inmates Jerry Martin and John Ray Falk, Jr., attempted escape. In the escape, Martin hit and killed prison guard Susan Canfield with a van. This March, Falk was sentenced to death as a party to the murder. And Texas has executed at least five people under the statute, according to the Death Penalty Information Center. Only five other states have executed anyone under similar laws. Aside from the law of parties, two identical bills to get rid of the death penalty in Texas completely were also heard Monday evening. Dutton and Rep. Jessica Farrar filed House Bills 64 and 1537. “This bill might not pass this time, but if it doesn’t pass this time, we’ll be right back here next time, fighting the same fight,” Dutton said earlier Monday at a press conference on his two death penalty bills. Fourteen people testified in support of abolishing the death penalty for reasons ranging from arbitrary sentencing to the cost of appeals. One woman tearfully spoke of her death-sentenced husband. No one spoke out against the bill. The remaining bill focused on the death penalty was one by Rep. Barbara Gervin-Hawkins, a democrat from San Antonio. House Bill 3411 aims to lessen requirements to become the lead defense attorney in capital murder cases to allow for more lawyers to handle the backlog of death penalty cases. 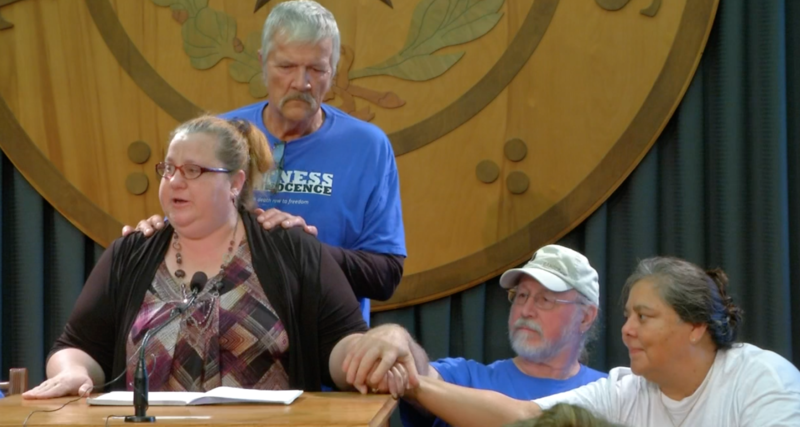 Texas Defender Services Executive Director Amanda Marzullo argued against the lesser requirements, saying she believed it would cause more trouble in the appeals process and that there were other ways to ease the backlog such as creating a public defender office. All of the bills were left pending before the committee. This article originally appeared in The Texas Tribune at https://www.texastribune.org/2017/04/18/multiple-death-penalty-reform-bills-heard-texas-legislature/. 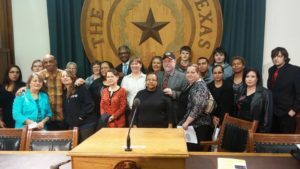 The 2017 Statewide Texas Lobby Day to Abolish the Death Penalty will be held Monday, April 17, 2017, when the House Committee on Criminal Jurisprudence will hold a hearing on the bills to abolish the death penalty and the bill to ban executions in law of parties cases. Members of Jeff Wood’s family and Kenneth Foster, Jr’s family will testify at the committee hearing in the afternoon and speak at the press conference at noon in the Speaker’s Committee Room 2W.6. Schedule of the 2017 Statewide Texas Lobby Day to Abolish the Death Penalty, April 17, Monday. 9 AM – 10 AM Check-in and meet for directions and lobbying tips. Capitol cafeteria, room E1.002. They serve breakfast till 10:30. 10:00 – Noon Visit legislative offices to lobby legislators to support abolishing the death penalty and banning death sentences in law of parties cases. Noon Press Conference in the Speaker’s Committee Room (2W.6). Special guests include State Rep. Harold Dutton and State Rep. Jeff Leach, plus Terri Been and other family members of Jeff Wood, who remains on death row convicted under the law of parties, and Lawrence Foster, grandfather of Kenneth Foster, Jr, who won clemency in 1007 after being sentenced under the law of parties. 1 PM Lunch at your own expense in the Capitol cafeteria. 2 PM Hearing on abolition and law of parties bills in Committee on Criminal Jurisprudence E2.014. You can testify verbally, submit written testimony, or just sign in to support the bills without testifying. A judge in Kerrville will only consider pleadings and evidence already in the record for the death sentence appeal of Jeffery L. Wood, one of two men convicted of capital murder for the 1996 robbery and slaying of a store clerk there. 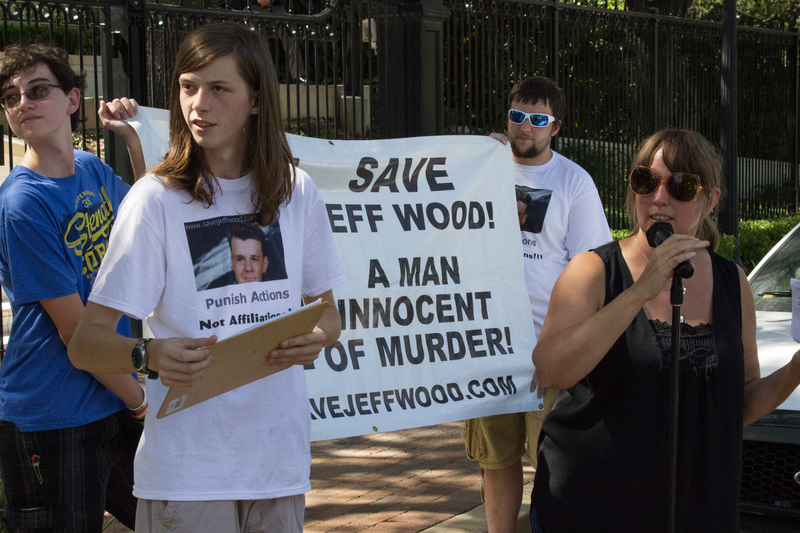 In staying Wood’s execution last August, the state Court of Criminal Appeals directed the trial court to review defense claims that Wood was denied due process because the sentence was based on false testimony and fake scientific evidence. The last-minute reprieve was cheered by supporters of Wood, whose case has garnered widespread coverage due what some cast as the overzealous prosecution of a defendant of limited intellect who initially was deemed mentally incompetent to stand trial. Rather than admitting new evidence into the record or conducting a hearing, state District Judge Keith Williams on Wednesday directed both sides to submit by March 29 their proposed findings of fact and conclusions of law concerning Wood’s writ for habeus corpus. “The court hereby determines that there are no existing controverted, previously unresolved factual issues material to the legality of applicant’s confinement,” Williams’ order says, in part. To read the entire article, go to the San Antonio Express News.